At work there is a plan to bring in performance targets in people’s performance appraisals linked to publications. Peer-reviewed journals are one of the most prestigious ways of being recognized for good science and every scientist should aspire to having a certain number of peer-reviewed articles accepted each year. When I heard this, sitting on the train on my way home from work, my hackles rose. “Targets!” I thought, “We will be getting into a ‘target mentality’ and we know that that is no good!”. Target mentality is what happens when you confuse means with ends and wind up with perverse incentives. For example, to combat crime, you set targets for police officers to arrest people, and they finish up maybe compromising their role in prevention and watchfulness in order to meet their targets. Targets are also seen in one of Senge’s archetypes: Shifting the Burden. 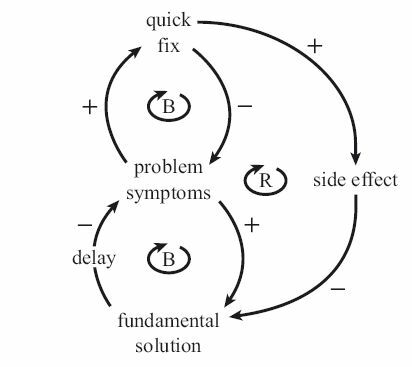 This archetype illustrates the tension between 1) the attraction (and relative ease and low cost) of devising symptomatic solutions to visible problems and 2) the long-term impact of fundamental solutions aimed at underlying structures that are producing the pattern of behavior in the first place. So, I went back to the book that made me wary about targets in the first place, Systems Practice in a Climate-Change World (Ison 2010), for guidance. The target mentality is presented in the context of “four pervasive institutional settings [considered] inimical to the flourishing of systems practice and which are also unhelpful in preparing us for our living in a climate changing world” (p218). One reason Ison finds targets unhelpful is because we live in world of uncertainty and complexity, but we have a desire for certainty which we build “into our institutional arrangements through devices like ‘deliverables’, ‘key performance measures’ or ‘goals’”. He goes on to suggest that having targets allows people to abrogate their responsibility for what happens. Once we have a series of targets or goals to deliver, we might stop asking questions and simply produce what is agreed to, learning and flexibility is avoided. It is a privileging of the systematic over the systemic, an example of the thinking which presumes IF you do X THEN Y will follow (If you publish your work in peer-reviewed journals, then it will be more authoritative, then it will make more difference, then you will benefit the poor better). In Britain under New Labour (which I missed being here in Rome) a “targets culture” has become endemic it has been claimed. An article by Simon Caulkin claims 400 people may have died through the misguided target culture in British hospitals! Well, no one is likely to die because we have targets for peer-reviewed articles at work. But perhaps the argument is wider than that. Simon Caulkin says “targets distort judgment, disenfranchise professionals and wreck morale […] Targets make organizations stupid. Because they are a simplistic response to a complex issue, they have unintended and unwelcome consequences”. Aha! So maybe that is the key. Maybe we need to separate out if this is a complex issue or not. Perhaps the scientists not publishing enough is not complex but a simple issue. It will be interesting to see if it is the thin edge of the wedge and we start developing targets for everything, if we start seeing unintended and unwelcome consequences – likely to be that something essential but unspecified (unmeasured and unrewarded) gets supplanted by work towards the target. What do you think? Am I overacting? ← why do we think what we think? Communication between communities: are we speaking the same language? Can a CoP function with only voluntary contributions?